This ingenious kit features lawn implantable bone appendages--a realistic looking skull, forearms, and legs with articulated hands and feet--that are stake mounted for easy installation into the ground. 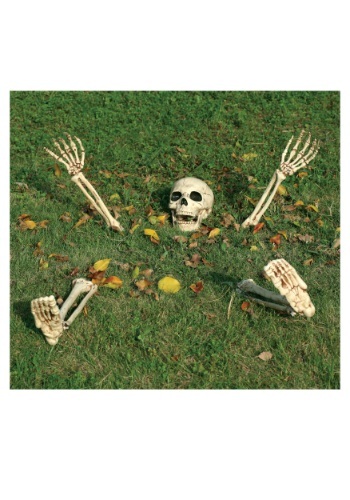 It will really look like the dead are rising from their earthen graves, right in your front lawn! We just hope that you don’t come across any real skeletons while you are staging these pieces, they have been known to crawl out from the dirt to defend their own kind. That’s how believable this kit really is! Good quality. Made better than most!